At the Old Folks Association the doors drew me in – open one and there were two more! – sometimes shut (some locked), sometimes open, depending on who is using the building and how they feel about the need for some privacy. Pertinent to old age, I had read research showing we are more likely to forget what we have gone to find when we walk through a door to go and get it. So, not a good thing for old folks to have a lot of doorways to walk through to go and get the minutes book or a pen. Having photographed the doors from inside and out, open and closed, the cupboard doors attracted my attention – there is a wall full of cupboard doors! But inside the cupboards, so many cups, glasses, plates …… Discovering all these items for providing comfort and refreshment supported my initial sense that this is a building which welcomes you. The stated objects of the Old Folks Association were “to overcome loneliness and offer friendship and happiness to elderly people”, and there is a strong sense of hospitality which is being maintained today by a new group of carers. This would have mitigated any negative effects of having to walk through many doors. I am finding it a splendid place to spend time, and enjoy the encounters with the people of all kinds who come to use the building. Working there is an open-ended thing, an opportunity to let ideas develop and to develop a bit of a routine of “going to the studio” where I draw, paint and think. 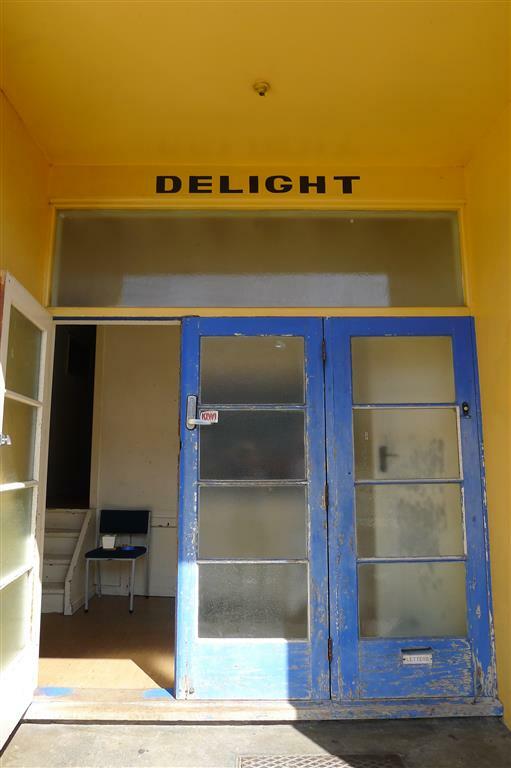 I have installed a new sign over the front door to replace ADORE – it is DELIGHT – a synonym for ENTRANCE and also a play on the fact that there is no LIGHT ( the fitting in the porch is broken). But also seen I hope as expressing an invitation I have felt OFA extends to anyone who wants to come and enjoy the magic of this modest building and the people who create events in it.